I should have done something unusual for the last day, wrestled a yak, swum the Hellespont or climbed the Shard (the new skyscraper going up by London Bridge, a modern Tower of Babel if you ask me). But I ended with a whimper, not a bang, with a little cycling, six miles all told. Looking back, when the idea of Janathon was mooted, I thought it impossible. How would it fit with marathon training? How could I manage something athletic every day, in the longest, dreariest month of the year? And yet here I am at the end, having, with the exception of some days when I have medical certification, managed it for every day, mostly running but also cycling and swimming. I feel much better for it. There is the small matter of a sestina that I promised JogBlog, but which I fear has not yet been written. Perhaps a Pindaric ode instead? All Janathoners are in JogBlog's debt. We prostrate ourselves before her. Down in Andalucia, the brave people of Running Commentary ran a hot half marathon at Almeria. Here it was damned cold, but in their honour I tried for the same distance, including quite a lot of forest running in Friston forest, while we're still allowed to. It was cold when they went for the run. It was the sort of cold that would stop you thinking about the thing with the women. It was cold. The shepherd gave them the wine, the wine kept in goat skin. They drank it. It was good. Before the war, it had been different. Now they could do nothing. Somedays, the gypsy woman brought the aguardiente . That was good, and when they had drunk it they talked about the dead man, and about the thing with the women. Then they slept, waking no better. In which I went to the ballet (amazing), had another swimming lesson in which Alan the instructor fitted me with flippers in an attempt to correct my kick, and ran four miles along the seafront in a bitter wind.Tomorrow, a half-marathon. I cycled: five miles, or a little over. Today is a rest day from marathon training. This isn't much of an effort, but it will do. I took myself off for a five-miler, once more an exploration of places I used to know. So I went up to King's Cross, then up to Barnsbury and Canonbury and back. It was bitingly cold.That is probably all I can say, without giving way to excessively personal reflections on people and events a long time ago. I had a lie-in and rose at 5:45, waking from a dream in which I was duty manager in a former, hated, job, and had to deal with a wild boar loose in the building. Off I went for six miles along the sea-front. The weather forecasters had said it would be cold, so I had laid out a jacket , gloves and an ear-warming headband the night before. In the event I did not need any of these. Neither did I meet any wild boars. I had knocked the sedative out of my system sufficiently to run at lunchtime, so I summoned up the genie of the Garmin and commanded him to make me run eight sets of fast 400 metres, with 200 metre recoveries and a mile warm-up and cool-down. Garmin Connect is down at the moment, so I can't illustrate the point, but for some reason the fast 400m and slow 200 m sections were put back to front so the recovery came before the effort. It took a little while for me to work out what was going on, but once I did, I ran some sections fast and others slow, so the general effect was achieved. I also took myself through some intriguing parts of Hoxton and De Beauvoir Town. Somewhere near here the Bolshevik party held one of its congresses in exile; I must find out where. I am sorry to say that I have to ask if Tommy can be excused Janathon today. He has had to go to hospital and is feeling a little delicate. As you know, he is a sensitive boy, and his father and I wonder if he should be outside with the rougher boys, especially in these cold winds from the north. Perhaps he could help you tidy the classroom instead. He has brought his goose fat with him. Please would you be kind enough to ask the school nurse to rub it on his chest? I had to go to hospital today, for a gastroscopy, which I had under sedation. It therefore seems inadvisable to do any Janathoning. The letter I brought home from the hospital specifically forbids me from riding a bicycle or, indeed, a horse. I'm also not supposed to operate electrical machinery, but I hope my MacBook Pro is not machinery within the meaning of the act. I left the car at the sailing club last night after a wonderful Burns Night supper; Jane's haggis was a triumph and my trousers were the talk of the party. 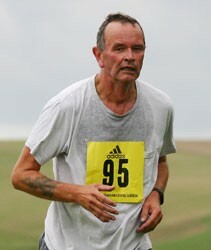 I ran today by way of Firle Beacon. The exposed sections of the route on the top of the escarpment were cold in the northerly wind; in Bishopstone village I came upon a field of lambs, and the snowdrops that grow in a little wood near the church are starting to come out. I finished at the sailing club. The bar opens on a Sunday afternoon, but I had cars to drive. I felt tired afterwards, but form now on all my long runs will be greater than this distance. Even on the Sunday before the marathon, I do twelve miles. I finished the day with a four miler at the end of the day, to South Barn, Hope Gap and Seaford Head.